The first CS100 intended for commercial service being assembled. Bombardier’s announcement: revising the entry into service (EIS) of the CSeries: came as a surprise to noone. You didn’t even need company insiders to leak information about the slow progress of the test flight campaign. The media front-ending is clue enough: the lack of updates, and the general lowly feeling : gave away a test flight campaign with nothing much to talk about. Bombardier isn’t the first manufacturer to declare intensive test flight campaigns and program milestones, only to show the world that their program management planning wasn’t planned at all. The trend has been in alphabetical order: Airbus – Boeing – Bombardier. The Airbus A380 and the Boeing 787 programs talked of entry into service dates that were too good, only to be found later that that they were too good to be true. For Airbus, the A380 was a first: in terms of size, wiring, and a level of coordination in design that was not well coordinated. For Boeing, the airplane was, technically, a new design, with many firsts: technical and production, leading to software issues, and supply issues. The graph below shows how unique, technically challenging, and possibly operationally “disruptive” airplane programs, show longer periods between the first flight & entry into service (EIS). The A300 was Airbus’ first airplane; the A340 was Airbus’ first quad-jet. The A350 has nothing special about it: it builds upon the A380’s avionics & software; the only thing new is the extent of use of composites. 12 months for the program should be doable. Legend: Blue: Past programs, Red: programs with significant gap between FF & EIS, Orange: Programs in progress. In comparison to the A380 and the 787 programs, the CSeries is a “stranger” airplane for Bombardier. It is Bombardier’s first all new airliner design (the CRJ series is a derivative of the Challenger from Canadair, the Q400 is a modification of De-Havilland’s turboprop offering), the manufacturer’s first airplane so big, the first airplane in the world to fly with the PW1000G Geared Turbofan Engine (never before has such a large GTF ever flown), the companies first fly-by-wire aircraft, Bombardier’s first foray into designing an all composite wing for a commercial aircraft, and the first use of Al-Li on such scale on a narrowbody aircraft. It is so new, that it is to Bombardier what the 787 is to Boeing. A great airplane, promising excellent fuel savings, but exhibiting a huge leap in technology & process: a toxic combination that introduces too many variables in one go. The CSeries program has pushed the first deliverers by nine months to the second half of 2015, taking the time between first flight and EIS to a projected 21 months. The CS300, is expected to enter service 6 months later. That is terrible news for Bombardier: The CS300 is expected to enter service in early 2016. The CSeries was the very aircraft that made Airbus and Boeing reengine their airplane. But with the A320NEO planned to enter service in 2015, the popular single aisle family, which members A319NEO and A320NEO compete directly & indirectly with the CS300, will be available earlier, and with a better appeal: thanks to a proven airframe: the A320 family’s. Considering that Airbus can afford upto 25% off on the list prices, the A319NEO can be sold for for US$70.8M, about US$7M costlier than the CS300’s list price. 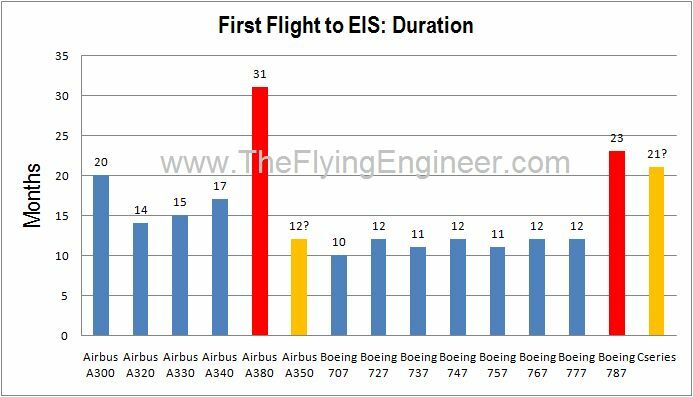 The CS300 burns lesser fuel than the A319NEO, and is expected to have the same operating cost per seat as the A320NEO. The CS300 still has an appeal: massive appeal. Technically that is, operationally: uncertain. “We are taking the required time to ensure a flawless entry-into-service. We are very pleased that no major design changes have been identified, this gives us confidence that we will meet our performance targets,” said Mike Arcamone, President, Bombardier Commercial Aircraft. But questions still linger in the minds of most: with so much so new to Bombardier, how reliable will the airplane be? Will the CSeries become the narrowbody “Dreamliner”?